The "Haitian Joudalist" has learned that former Haitian President, Mr. Jean-Bertrand Aristide will come out of his silence to deliver his first major speech since returned in Haiti. It has been five Months since his return and the Lavalas leader has kept a low profile for for five Months. All that is to end next Month when Jean-Bertrand Aristide will deliver his first major speech in Haiti since. According to Former Senator Louis Gerald Gilles, Former President Aristide will deliver his speech during a ceremony in October to inaugurat the expansion of his University. No exact date for the speech was announced. 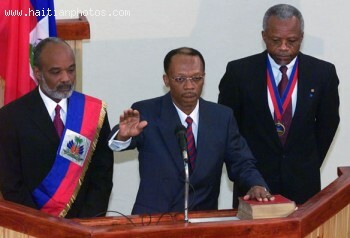 Will this speech in October signal the beginning of a new era for Jean-Bertrand Aristide in politic? Taking the current political situation in Haiti, do you think it is a good thing for Former president Jean-Bertrand Aristide to come back on the public scene? Former Senator Louis Gerald Gilles told The Associated Press that Jean-Bertrand Aristide is planning to deliver the speech on education. Do you think he will only be talking about education? Will he make his position know to his fans by using code words that he has become famous for?